If and when those long-rumored Buffy and Angel movies get off the ground, they won't star series leads Sarah Michelle Gellar or David Boreanaz. 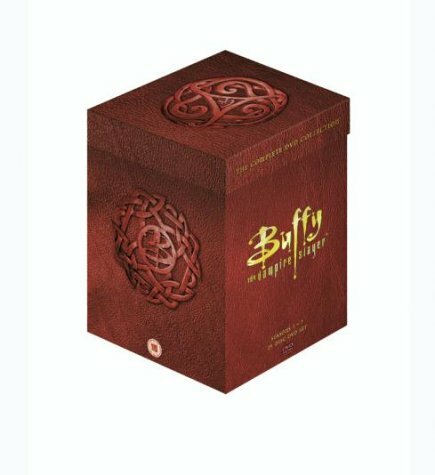 "The idea would be to focus on the supporting cast: Spike, Faith, Willow, Giles, et cetera," says a well-placed Buffyverse source, adding that while "nothing is set in stone," both WB and the shows' creator, Joss Whedon, "are trying to make something happen." Interesting they are now saying one of the four movies will be about Faith, rather than Angel as previously rumored. Could have something to do with DB insisting on a feature length movie rather than a tv movie. James will be shooting an episode of the new WB series “The Mountain” later this month. He will play the character of ‘Ted Tunney’ a handsome, charismatic, outgoing former rock and roller. He is a likeable guy who famous for wasting his occasional sober energy on get rich quick schemes. He is the kind of lovable fool who inspires both frustration and compassion. I haven't watched the Mountain because it looks awful, but hopefully this episode will air before the show is cancelled. She is also featured on the cover of the October 8th issue of Entertainment Weekly (the photo issue). The last I heard was BUFFY animated is still trying to find a home (although SHOWTIME, was rumored). Nothing on RIPPER, I'm afraid. Joss busy making major motion pictures. If you liked Michelle Trachtenberg in EuroTrip or you were just waiting for Dawn to follow in Faith's skanky footsteps, then you will like these pictures. candygirl wrote: If you liked Michelle Trachtenberg in EuroTrip or you were just waiting for Dawn to follow in Faith's skanky footsteps, then you will like these pictures. I have done it with all kinds of ladies ... from the lowest bus station skank to the most high-society debutante bus station skank. Only one more week before S7 is released on DVD! Although I don't love that particular season, I am a completist and I must have it. I haven't decided which season was worse - six or seven. I will have to have a mini-marathon to assist me in making a decision. And am I the only one who is freaked out by how they photoshopped SMG's eyes to match the background? it would also be great if they didn't use the same photos on the covers. I mean, there are only 7 seasons, I'm sure they've done more photoshoots with SMG!! sheesh! Apparently they didn't do the usual cast shots for S7. This was released as the official S7 cast photo, but you can see that it's just a photoshop of this S6 picture. Picked up Season 7 today. Word of warning: the floaters are back The first disc was a floater for me, but it doesn't look damaged in anyway so I am hoping it is ok.
Was going to order it at DDD with the 20% off sale, but figured I would be better spending the few bucks extra to get it in person so the floaters wouldn't be an issue (if there was any). When you say "floaters" you mean the discs are not secured on the center ring in the case? Is that right? Sorry to sound naive here, guys. fnordboy wrote: Picked up Season 7 today. Word of warning: the floaters are back The first disc was a floater for me, but it doesn't look damaged in anyway so I am hoping it is ok. Mine is on its Merry way from the local Amazon warehouse in Fernley, NV. Where ever that is. I have noticed that with Buffy and Bablyon 5 sets typicall the 2nd discs are floaters. I expect my season 7 set will be no different. Candygirl, I agree with you on the completeist stuff. This is why I am ordering Farscape: the Peackeeper Wars on DVD to complete my Farscape Collection as well. That DVD will be well worth it. Kristin wrote: When you say "floaters" you mean the discs are not secured on the center ring in the case? Is that right? I just found out that Target was selling S7 for only $17.77 over the weekend. I had already resigned myself to paying $35-$40 for S7 to complete my set, but buying it would have been a lot less painful if I had paid less than $20. candygirl wrote: I just found out that Target was selling S7 for only $17.77 over the weekend. Yeah I know, pissed me off. Though I am already on the 4th disc, I don't think I could have waited for it. I have to say S7 is not nearly as bad as I expected it to be. I am finding it somewhat enjoyable, though some of the characters are annoying and stupid. I wonder if the problem a lot of people had with the season is that it is so jumbled and confusing at times. Watching it on a week by week basis would be tiresome and confusing I would think, but watching it back to back allows it to make more sense. People are reporting that stores with price matching policies (Walmart, Best Buy) are honoring the Target price of $17.77 for S7 - just print this page from this week's Target ad and bring it in! In yet another of those arbitrary 'Top 100' lists, Buffy placed as the 13th greatest TV character, just above M.A.S.H. doctor Hawkeye Pierce and right behind Edith Bunker of All in the Family. See the complete list here, or watch the five-part series on BRAVO.